A general term that describes many complex processes in which color is added in the form of a solution of synthetic or natural dyes to fibers, yarns, or fabrics. Dyes are organic chemicals that produce intense color, are water soluble or dispersible, and bond with fibers. When struck by energy in the form of light, the chemical absorbs, reflects, or transmits specific wavelengths of the energy. The wavelengths and concentrations of the reflected light determine the color seen. The composition and structure of the dye chemical determines its color and the fiber with which it forms a chemical attraction. This means that dyes are fiber specific. Dyes are incorporated into fibers by chemical reactions, absorption, or dispersion. Commercially important dyes must be relatively fast to resist environmental factors such as cleaning agents, light, air pollutants, and perspiration. Dyeing is usually done by immersing and moving the textile in a heated, dilute dye solution in a bath or vat. Except for a few cases (for example, resist methods), the desired result is an even or level color. Dyeing includes some preparation steps, such as scouring, bleaching, and mordanting, as well as some after-treatment steps to improve the fastness of certain dyes. Dyeing can be classified based on the stage of processing of the textile when the dye is added, the process used in dyeing, or the type of dye used. In mass pigmentation, dope dyeing, or solution dyeing, colorant is added to manufactured and synthetic fibers before fiber formation. Mass pigmentation is permanent and relatively expensive. Fiber or stock dyeing adds dye to loose fibers, fiber top, or sliver (a yarn precursor in producing yarn from staple fiber). Stock dyeing creates heather effects in which adjacent fibers are different colors. In yarn and skein dyeing, yarns are dyed for fabrics, such as denim and chambray, in which only the warp yarns are dyed. Yarn dyeing produces better quality stripes, plaids, and structural designs with colored woven or knit designs. Piece dyeing is used to dye fabric lengths or yardages a solid uniform color. However, fiber blends, mixtures, and combinations present other options for piece dyeing. In cross dyeing, each fiber type absorbs a different color dye. Cross dyeing is one way of achieving a yarn-dyed appearance while skipping the yarn-dyeing step. In union dyeing, dyes from different classes are carefully selected to create a solid color on a fabric of two or more different fiber types. In product or garment dyeing, the textile is cut and sewn into the final product and then dyed. Careful preparation and selection of thread, closures, labels, and trims is necessary to ensure that all desired components are dyed the same color while other components (labels, for example) are not dyed or stained. Many different dyeing processes exist. In batch processes, a predetermined quantity of fiber or length of yarn or fabric is dyed. In continuous methods, very long lengths of yarn or fabric are dyed. In skein dyeing, yarns are wrapped around poles and vat dyed. In package dyeing, yarn is wound onto perforated tubes through which dye is pumped. In beam dyeing, yarn or fabric is wrapped around a large perforated beam through which dye is pumped. In beck and jet dyeing, fabric is loosely twisted into a long loop and circulated around reels and guide rollers into and out of the dyebath. Jig dyeing is a batch process in which the fabric is under tension during dyeing as it passes through the dyebath and winds onto one roller, reverses direction, and passes back through the dyebath and onto the other roller. In continuous dyeing, the dye is padded onto the fabric, excess dye is removed by rollers, and steam heat sets the dye. Dye classes can be organized by application method. Acid dyes require an acidic pH, are used on wool, silk, and some manufactured fibers, and produce strong clear colors. Metalized or mordant dyes incorporate metal in their molecular structure that dulls color but improves wash fastness. Direct dyes are applied directly to cellulosic fibers in a neutral or alkaline bath and give slightly dull shades. They exhibit poor wash fastness, unless after-treated with a metal salt solution. Disperse dyes are slightly water soluble and used to dye most synthetic fibers. Fiber reactive or reactive dyes are applied in an alkaline environment, react with the hydroxyl groups of cellulose, and produce bright shades on cellulose. Sulfur and vat dyes are solubility cycle dyes that are applied to cellulosic fibers in a reduced, colorless form and reoxidized to the insoluble, colored form on the fiber. They have good fastness to washing and sunlight. Basic or cationic dyes are applied to cellulosic, protein, and some synthetic fibers in slightly acidic or neutral solutions. Azoic dyes are formed on the fiber through a coupling reaction of two components. 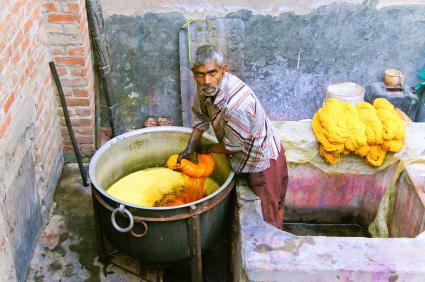 Natural dyes are complex mixtures of components derived from plants, animals, or minerals. Dyeing was a hand process for thousands of years. Dyers used large containers or vats for coloring relatively short lengths of fabric or small quantities of fiber and yarn. Until the development of synthetic dyes, all dyes were natural compounds. Fastness varied widely among the natural dyes. The processes required to achieve certain colors were long and involved and carefully guarded by dyers. In the latter half of the nineteenth century, research into a better understanding of the chemistry of natural dyes led to the development of synthetic dyes. By approximately 1900, synthetic dyes had replaced natural dyes in almost all applications. Developments during the industrial revolution increased the amount of fiber, yarn, or fabric dyed in a vat. Dye boxes, vats, and jigs were the primary pieces of equipment used to dye industrial quantities of fabric in batch methods. However, in the twentieth century, researchers developed continuous methods so that undyed fabric would enter and dyed fabric would exit the machine. Other twentieth-century developments increased production rates, improved dye quality, and lowered costs. See also Resist Dyeing; Chemical and Synthetic Dyes; Natural Dyes. Kulkarni, S. V., C. D. Blackwell, A. L. Blackard, C. W. Stack-house, and M. W. Alexander. Textile Dyeing Operations: Chemistry, Equipment, Procedures, and Environmental Aspects. Par Ridge, N.J.: Noyes Publications, 1986. Society of Dyers and Colourists and the American Association of Textile Chemists and Colorists. Colour Index. 3rd ed. London: Author, 1971. Trotman, E. R. Dyeing and Chemical Technology of Textile Fibres, 6th ed. New York: John Wiley and Sons, 1984.